Barrackpore, or Barrackpur, is the headquarters of the Barrackpore subdivision in the city of Kolkata, and is situated in North Kolkata. Barrackpore is a part of the area covered by the Kolkata Metropolitan Development Authority in the Indian state of West Bengal. Historically, the town was a military and administrative center under British rule, and was the scene of several acts of rebellion against Britain during the 19th century. The oldest cantonment in India and the Police Training Academy in West Bengal are both located in Barrackpore. Barrackpore is also the seat for the Sub-Divisional Court of Northern 24 Parganas District. The Barrackpore Police Commissionerate is responsible for law enforcement in the city. The name Barrackpore may have originated from the English word barracks, as it was the site of the first cantonment of the British East India Company. Alternatively, the Ain-i-Akbari suggests that the name comes from "Barbakpur". Manasa Vijay, written by Bipradas Pipilai, refers to Barrackpore as "Chanak". The earliest references to the Barrackpore region are found in the writings of the Greek navigators, geographers, chronicles and historians of the 1st century BC to the 3rd century AD. These authors generally referred to the country of a people variously called the Gangaridae, Gangaridai, Gandaritai etc. By the 15th and 16th centuries, Chanak and the other towns in the region had become populous river towns. The Statistical Account of Bengal by W.W.Hunter mentions the towns and villages of this subdivision on the banks of the Hooghly river as chief trading and marketing centres: "On The Hugli- Calcutta, the chief seat of commerce in India. Baranagar, Dakhineswar, Agarpara, Panihati, Sukchar- Khardah, Barrackpur, Nawabganj, Ichapore, Shyam Nagar, Naihati and Halisahar contain large bazaars for sale of miscellaneous goods." Under the Mughal Empire, Bengal was divided into Circars, or administrative subunits, each of which was ruled over by a Mahal. 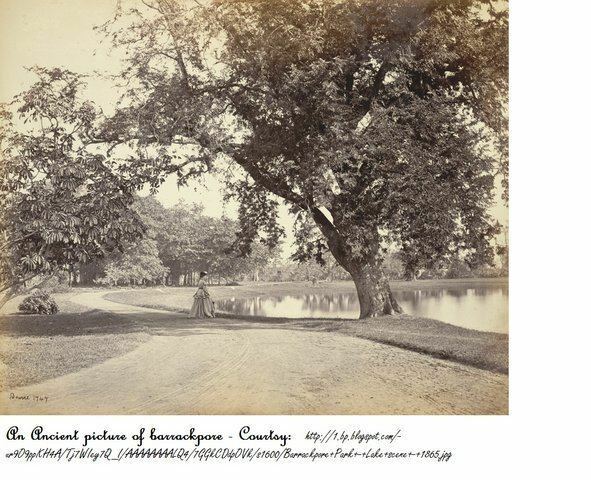 The name "Barbuckpur", another name for Barrackpore, is associated with a Mahal in the Ain-e-Akbari. 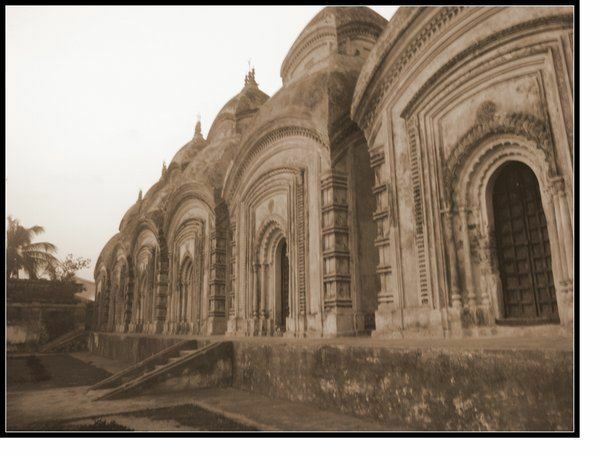 From the 17th century, the area was ruled over by a line of Zamindars based in Nona Chandanpukur, Barrackpore. The first British barrack or cantonment in India was built in the town in 1772. After the British crown assumed direct control of India, the sprawling Government House and the Government Estate were built in Barrackpore to provide the viceroy with a suburban residence 15 miles (24 km) outside of Calcutta. Two rebellions against British authority took place in Barrackpore in the 19th century. The first of these was Barrackpore Mutiny of 1824, led by Sepoy Bindee Tiwary. In this rebellion, 47th Bengal Native Infantry refused to board boats to cross the sea for various reason including social taboo "Kala pani (taboo)" to Burma in the First Anglo-Burmese War. Consequently, British-manned artillery fired upon and "erased" them. In 1857, Barrackpore was the scene of an incident that some credit with starting the Indian rebellion of 1857: an Indian soldier, Mangal Pandey, attacked his British commander, and was subsequently court-martialed. His regiment was disbanded, an action which offended a number of sepoys and is considered to have contributed to the anger that fueled the rebellion. In order to commemorate his sacrifice, a park named 'Sahid Mangal Pandey Udyan' was opened in the serenity of river Hoogly. The Army cantonment of Barrackpore also houses another significant historical landscape called the RCTC area, now populated by the defence quarters. The subdivision is served by road, rail and air transport. It benefits from the Hooghly River, which flows through the western part of this subdivision. The presence of the river aided the establishment of a large number of industries on its banks early in India's industrial development, including jute, engineering, paper, and cotton mills. Barrackpore has also traditionally had a strong small scale cottage industry and handicraft sector. The Army/Airforce cantonment is the biggest landscape of the town of Barrackpore, while agriculture is the main base of the subdivision's economy. Floriculture, pisciculture and horticulture have also flourished in the town. Central Inland Fisheries Research Institute has been established at Barrackpore to promote production of fishes mainly in ponds and rivers. A well-developed irrigation system has been constructed in the subdivision to promote agriculture. Low interest loans have also been used to encourage the expansion of farming and the development of agricultural infrastructure. The primary industry in Barrackpore is jute processing, centered in a number of jute mills on the side of the river. Ishapore Rifle Factory is one of the most important arms factories of India, . Mulazore Thermal Power Plant at Shyamnagar was one of the oldest power plants in India, but was shut down in 2004. Dry cells produced by Exide, and cables produced by Nicco are other industrial products. 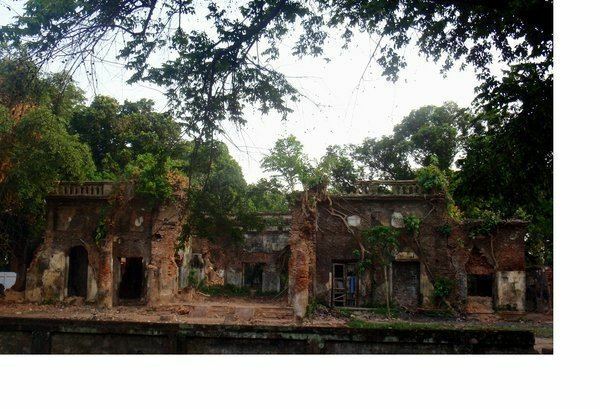 Barrackpore is also famous for Palta Water Works, its oldest water treatment plant, in the banks of Hooghly River. The plant was constructed from 1864–1870, and is situated on 480 acres (1.9 km2) of land. It was the first intake point for generation and supply of water and lately due to high demand of water. The Kolkata Municipal Corporation has commissioned the Indira Gandhi Water Treatment Plant near the same locality to augment the capacity of supply of water to Tallah. Barrackpore is one of the most developed regions in West Bengal.The literacy rate in the sub-division is above the average standard of the state and district. As of the 2001 India Census, Barrackpore had a population of 144,331. Men constitute 53% of the population and women 47%. Barrackpore has an average literacy rate of 81%, higher than the national average of 59.5%. 8% of the population is under 6 years of age. The majority of the population is Bengali and Hindu. The subdivision is inhabited by people from a broad range of cultures, with people of various religions, customs, castes and states living together. Mandirs, Masjids, Gurdwara, ashrams and Churchs coexist there. The Barrackpore subdivision is well connected by road, ferry and railways. With the two National Highways, NH-34 and NH-35, and several major State Highways passing through the area, most towns are well connected with Kolkata, its airport and port, and other important urban and commercial centres of the state. The main international airport in West Bengal, Netaji Subhas Chandra Bose International Airport at Dum Dum, is located in the subdivision. Barrackpore Air Force Station is an Indian Air Force base located at Barrackpore in the state of West Bengal, India. Barrackpore is one of the oldest stations in the IAF, operating transport units. One of the Mi-17 squadrons is based here. Barrackpore is well connected with Shrirampur and Sheoraphuli in Hoogly District by ferry service from Dhobighat and Sheoraphuli ghat. The Barrackpore Trunk Road (B.T. Road), one of the oldest metal roads in India, connects Barrackpore to Kolkata. The Ghoshpara Road connects the city of Barrackpore with Kanchrapara, a town on the boundary of the subdivision, and goes on to link Barrackpore with the adjacent district of Nadia. Several bus routes originate from Barrackpore such as 78 and 85. Route number 78, MM 5, 81, 78/C/1, K9 and other state owned bus routes (C29, S32) connect Barrackpore with Kolkata. Route number 85 connects Barrackpore with Kanchrapara directly and JM8 up to Naihati. Barrackpore serves as the gateway to Kolkata and its suburbs. Former Rail Minister Mamata Banerjee announced the extension of metro-rail project to Barrackpore which was later shelved infinitely. Barrackpore has been serviced by rail since 1862. It takes about 35–40 minutes by suburban train to reach Barrackpore from Sealdah. As they are located in a suburban region of Kolkata, most municipalities of Barrackpore are connected by local train with Kolkata. The Sealdah-Ranaghat Line runs through this sub-division and connects to Bongaon, Dankuni, Howrah, Burdwan, and Bandel. It is part of the Kolkata Suburban Railway system. The Circular and Metro Railways of Kolkata also offer an accessible means of transit to and from the sub-division. In January 2002 the rail connection to Bangladesh was reopened for goods movement to Benapole. Accessibility by road is currently being improved by the development of the Barrackpore-Dum Dum Expressway—a project to widen the Jessore Road and widen and strengthen the B.T. Road—and the widening of NH-34 under the North-South Corridor Project. Barrackpore was home to a number of significant members of the Indian independence movement, many of whom have memorials in the subdivision. Rastraguru Surendra Nath Bandyopadhyay, who was called the father of Indian Nationalist Movement, lived in Barrackpore. The house of Surendranath at Monirampur of Barrackpore has been converted into the Mahadevananda Mahavidyalaya and Netaji Open University. Bengali author Bharat Chandra Ray Gunakar, known for writing Annada Mangal in the medieval period, lived at Mulajore. Ramprasad Sen, who authored many religious songs, was born at Halisahar in this subdivision. Bankim Chandra Chattopadhyaya, the author of India's national song "Vande Mataram", was born at Naihati, in Barrackpore subdivision. Gallantry Award winner Army Captain Shekhar Ghosh is also from Barrackpore. The towns of Panihati and Khardaha are known for having been visited by Chaitanya Mahaprabhu and Nityananda Prabhu some 500 years ago. Annual festivals and melas are held at these places and draw large numbers of devotees. Later visitors included Sri Ram Krishna Paramahansa, Gurudev Rabindranath Tagore, and Mahatma Gandhi. The Gandhi Ghat is located on the east bank of the Hooghly; a Gandhi museum nearby has a rare collection of books and articles used by Gandhi. The Sukanta Sadan theatre hall (named after the revolutionary poet Sukanta Bhattacharya) is located in the main town. There are many cinema halls in Barrackpore and its adjacent localities. The Sahid Mangal Pandey Uddan (Nishan Ghat) park facing the Ganges at Barrackpore is a crowdpuller. Barrackpore is home to numerous schools, colleges and Madrasahs.The Ramakrishna Vivekananda Mission School at 7, River side Road is one of the good educational institutions at Barrackpore. Among the colleges located in Barrackpore are Barrackpore Rastraguru Surendranath College and Mahadevananda Mahavidyalaya. 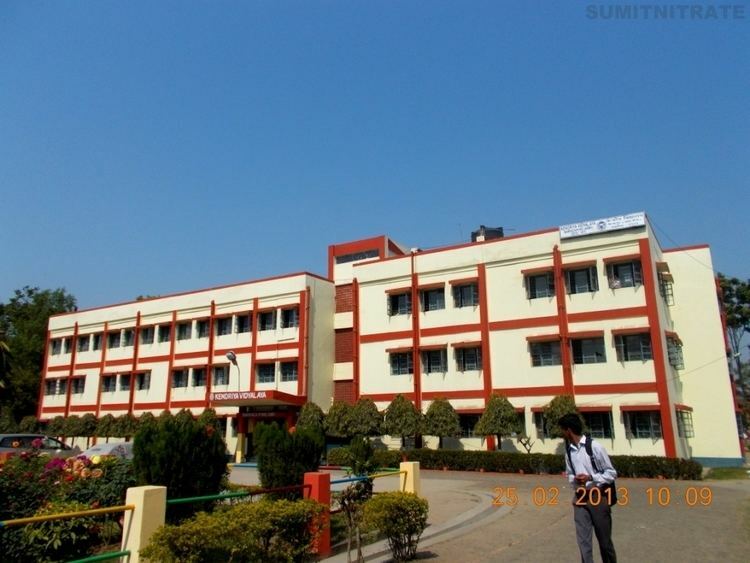 The area also has two engineering colleges, one namely St. Mary's Technical Campus Kolkata affiliated to AICTE, several polytechnic institutes and an international boarding school, Adamas International School. Moreover, Barrackpore is the home to many Primary and Play Schools like Swami Vivekananda Centre for Learning Barrackpore, kidzee, Path Bhaban, Little laureates as well as secondary schools such as Assembly of Christ School, Douglas Memorial Higher Secondary School, Army Public School Barrackpore, Kendriya Vidyalaya Barrackpore Army.Barrackpore Government High School is one of the oldest school in West Bengal & the oldest school of Barrackpore. It was established by Lord George Eden ( then Governor of India) in 1837.